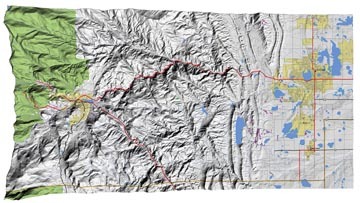 Brenton White Maps is dedicated to bringing you quality maps with a unique view of our magnificent land. Combining the power of today's computer technology with the availability of data sources from the U.S. Government and some really nice mapping software, it is now possible to artistically present nearly any place in the United States. Starting with state maps, Brenton White Maps presents each landscape in all its beauty and glory. Put to paper, each is a piece of artwork to treasure, view, and share with friends—of places visited or dreams to go. The magnificence of each state's topography, unique features, and human settlements are brought to "life" in seemingly three-dimensional splendor. The goal is to have maps that are suitable for framing. Because each one of us has a connection with so many different parts of the United States, custom maps can be produced to your desires. Here we show the outstanding topography from Loveland, Colorado—the Sweetheart City—to the rugged and beautiful city of Estes Park—doorway to the grand Rocky Mountain National Park. If your interest in maps is anything like Brenton White Map's, then we'd like to get to know you and share our love of this great medium. We hope to meet you and, with your support, bring great maps to life.